While Microsoft Outlook is rightly the world's most popular email client, getting your email messages out of Outlook can be a challenge. MessageExport is an add-in that improves the email export functionality of Microsoft Outlook, adding many new capabilities such as export to pdf, csv, text, html, mbox, gif and other useful formats. Developed by Encryptomatic LLC, MessageExport tightly integrates with the Outlook user interface to make it easy to export email from Outlook in different formats. MessageExport helps you get your email messages out of Outlook. It is compatible with Microsoft Outlook 2013, 2010, 2007 and 2003, both 32-bit and 64-bit versions of Outlook, integrating tightly with Outlook's menus. To use MessageExport, emails are selected from the Outlook email list, an export profile is selected, and then the blue "Export" button is clicked. MessageExport integration with Outlook main menu toolbar. 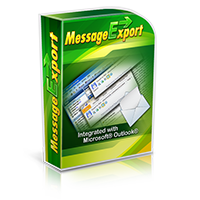 MessageExport also integrates with Microsoft Outlook's individual email message viewing pane. This is convenient for saving or archiving individual email messages as they are viewed. 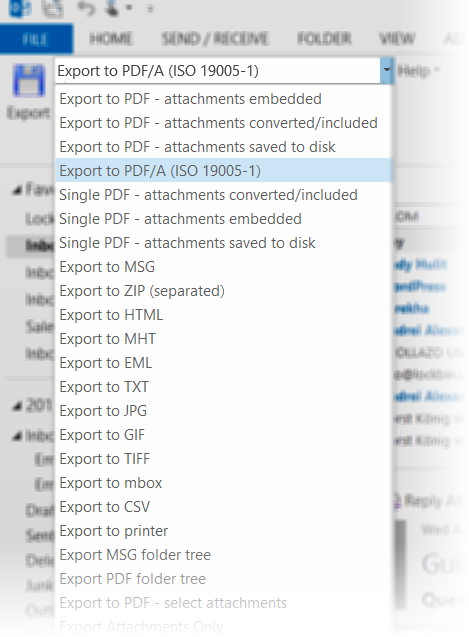 MessageExport toolbar in Outlook email toolbar. Users of MessageExport can access it's export extensions from a tab in the Outlook toolbar. The toolbar consists of a drop down list from which more than 25 different export operations (called profiles) can be selected. Export Profiles define email conversion operations. MessageExport's email export profiles can be edited and changed. New profiles can be created to accomplish specific email conversion tasks. For example, you could create a profile that would export selected Outlook emails, convert them to PDF, embed file attachments, compress it in a .zip file, copy the file to a Sharepoint directory, and then run an external application, on a schedule. There are endless ways to combine MessageExport's abilities to address specific tasks, thereby saving the user time and effort. MessageExport's timer function is perfect for automating email exports from Outlook. 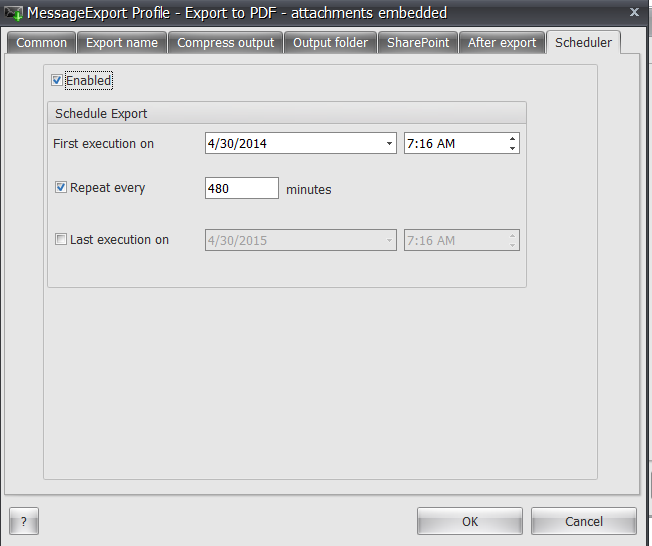 Any profile can be activated on a timed schedule, and set to perform a specific export operation on a specific folder. For example, if you used Outlook's Rules function to copy email from a specific person into a separate folder, you cold use MessageExport to automatically export those emails to any supported format (.pdf, .eml, .txt, etc) on regular basis, such as every 5 minutes, once per day, or whatever period of time is required. Automatically export Outlook email with MessageExport's timer functionality. Download a free trial of MessageExport. Try it free for 15 days with no obligation.